Head to the rivers, raise a glass and savor the tastes of summer: August is here. EQT Pittsburgh Three Rivers Regatta. Courtesy LIONHEART. Pittsburgh is home to the country’s largest inland regatta so don’t miss these three free days of thrills on land, in the air and on the water. Get your adrenaline pumping watching the world’s top freestyle athletes perform backflips and corkscrews during the Jet-Ski Freestyle Championships and experience the 150-mile-per hour action of the country’s most challenging Powerboat Tour Speeds course. Cheer on teams testing their nautical know-how with zany homemade crafts, and look up to witness the aerial amazingness of the Red Bull Air Force Sky Dive Team. Land sharks will love the frisbee-playing dog, 150-ton “Sandsational Sculpture,” Regatta Marketplace and Kids Zone. 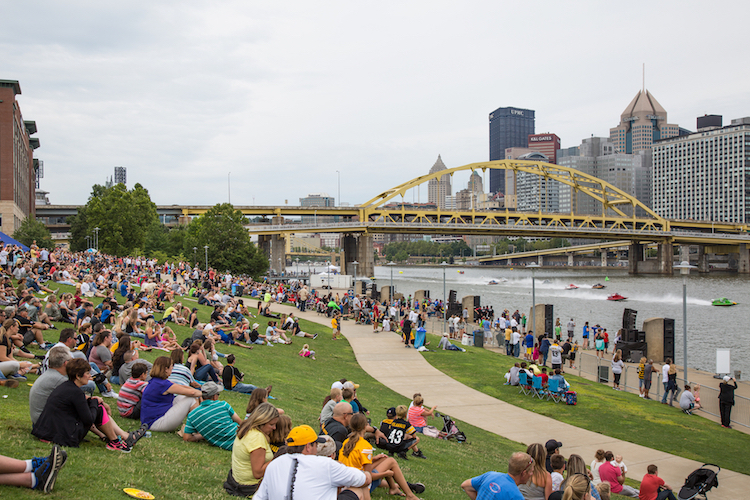 New highlights include the Pittsburgh Paddlesports Championships and Yuengling Beer Garden. 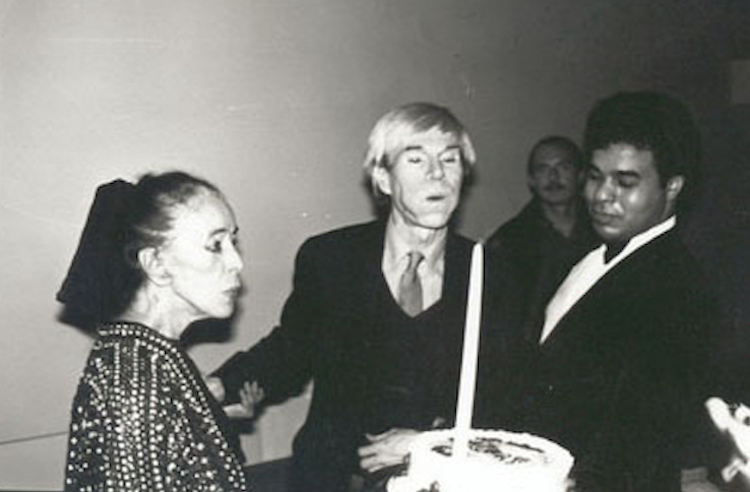 Andy Warhol, Andy Warhol, Martha Graham and a birthday cake, 1981, © The Andy Warhol Foundation for the Visual Arts, Inc.
2. Andy’s 90th Birthday at The Warhol Museum: August 4, 10 a.m. – 5 p.m.
Now is your chance to wander through silver clouds and film your own screen test while celebrating what would have been the King of Pop’s 90th birthday. Make original art in The Factory, attend gallery talks with the museum director and curator, and watch silkscreening demonstrations. Nosh on birthday cupcakes and snap a Warholesque photobooth selfie. At 5 p.m., head to Warhol’s grave at St. John the Baptist Byzantine Catholic Cemetery in Bethel Park — which is equipped with a live video feed — for a weather balloon launch, birthday cake, performances and music. 3. Rhythm and BREWS at Tall Trees Amphitheater: August 4, 1:30 – 10 p.m.
Rivertowne Brewing gets that Pittsburgh loves its beer and rivers. The fourth annual fest in Monroeville will feature a craft beer garden with fresh suds from Rivertowne, Full Pint, Arsenal Cider House, Roundabout, Yellow Bridge and Mindful. From folk to electro to world beats, the musical lineup has something for every set of ears, including performances by Buffalo Rose, Chalk Dinosaur, Starship Mantis and Afro Yaqui Music Collective. Fest-goers can grab lunch and dinner from food trucks like La Palapa, Big Boyz BBQ, Relish and Graeter’s Ice Cream. 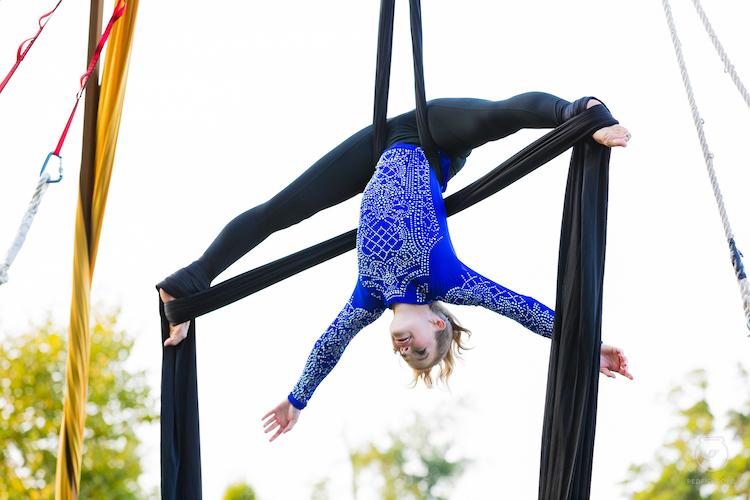 The all-ages event will also feature gravity-defying performances by Pittsburgh Aerial Silks. Proceeds will benefit six local charities. Buy tickets. 4. 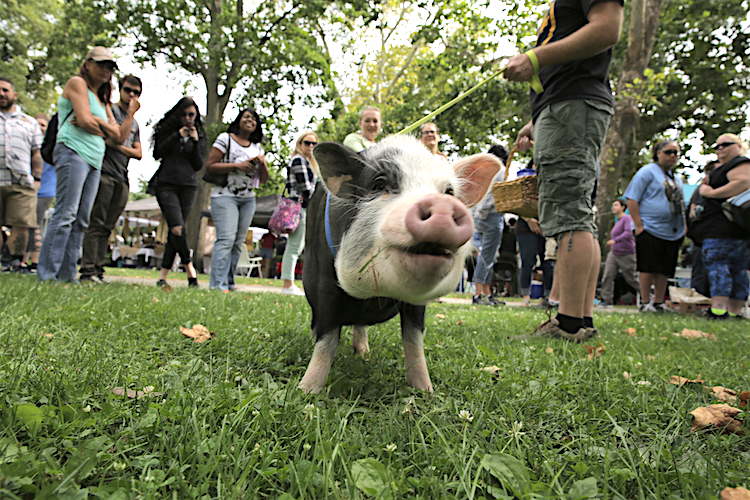 Pittsburgh VegFest at Allegheny Commons: August 4, 11 a.m. – 5 p.m.
Pleather vegan jerky, pet pigs, heavy metal-themed ramen, blue moon sundaes. If this sounds enticing, then you’ll love VegFest. Eat your way through 100 of the city’s top vegan food producers and purveyors while helping to make Pittsburgh a more compassionate, animal-friendly and sustainable place. Taste cool treats from Pennsylvania’s first vegan ice cream shop, sample veggie dogs and donuts and savor plaint-based global cuisine. Not to miss are the nourishing Eastern European dishes from Apteka, sinful desserts from Good Chroma and caffeine-fueled goodness from Allentown coffee gurus Black Forge. Much more than munching, the free fest also features live music, health and wellness vendors, massage and acupuncture sessions, fitness demos, and kids’ activities. 5. Millvale Brew Fest at Millvale Riverfront Park: August 11 @ 1 – 8 p.m.
Make an entire day of it in Millvale where the craft beer and carnival vibes will flow along the scenic Allegheny River. On tap for this 12th annual brewtopia is a staggering lineup of 180 craft, micro, nano and specialty beers from around the country. The music du jour includes performances by Elkhound and Working Breed and DJ sets by River’s Edge Radio. Local restaurants will provide unique bites — all $5 and under — and the popular “guess the mystery beer” is making a comeback. Buy tickets. The post 10 Pittsburgh events you won’t want to miss in August appeared first on NEXTpittsburgh.